SAN FRANCISCO (AP) — A young couple from India who wrote a travel blog were intoxicated when they died in a fall from a scenic overlook in Yosemite National Park in California, according to an autopsy report released Tuesday. Menakshi Moorthy, 30, and her husband Vishnu Viswanath, 29, each had intoxicating levels of ethyl alcohol, a substance found in most alcoholic drinks, the Mariposa County coroner said. The report didn’t provide a blood-alcohol ratio. Viswanarth’s tripod was later discovered on the edge of the overlook. His brother, Jishnu Viswanath said it appeared the couple died trying to take a photo. Moorthy described herself and her husband as “travel obsessed” on their blog, “Holidays & Happily Ever Afters,” which was taken down Tuesday. It had been filled with photos of the couple in front of snowy peaks and on romantic trips across Europe, where they took selfies from a gondola in Venice, at the Leaning Tower of Pisa and at the Vatican. 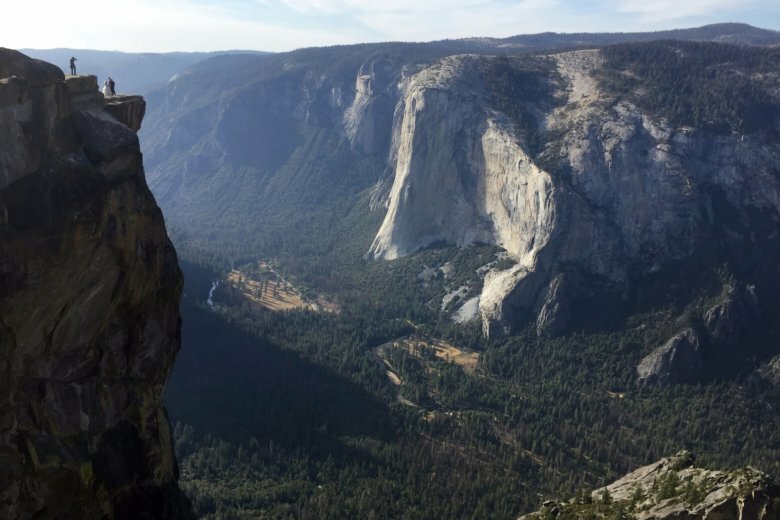 Park rangers found the couple’s bodies in October 800 feet (245 meters) below popular Taft Point in Yosemite. The coroner found both died of multiple head and internal injuries caused by their falls. Moorthy and Viswanath were born in India and had lived in the United States for a few years, most recently in the San Francisco Bay Area. Cisco India said Viswanath was a software engineer at the company’s headquarters in Silicon Valley. Moorthy and Viswanath graduated in 2010 from the College of Engineering, Chengannur, in the Alapuzha district of India’s Kerala state, said Nisha Kuruvilla, one of their professors. She said Moorthy and Viswanath were good students who were fond of traveling and had married at a Hindu temple in Kerala in southern India in 2014. Viswanath Facebook cover photo shows the couple smiling, with arms around each other standing at a Grand Canyon precipice. “Living life on the edge,” he wrote. “Between battling the tightening tentacles of depression and blustering in the tempest of moving madness, I am afraid social media is taking a back seat? ?” she wrote. The couple’s pictures indicated they liked to pose in scenic spots at sunset, the last time they were seen alive.